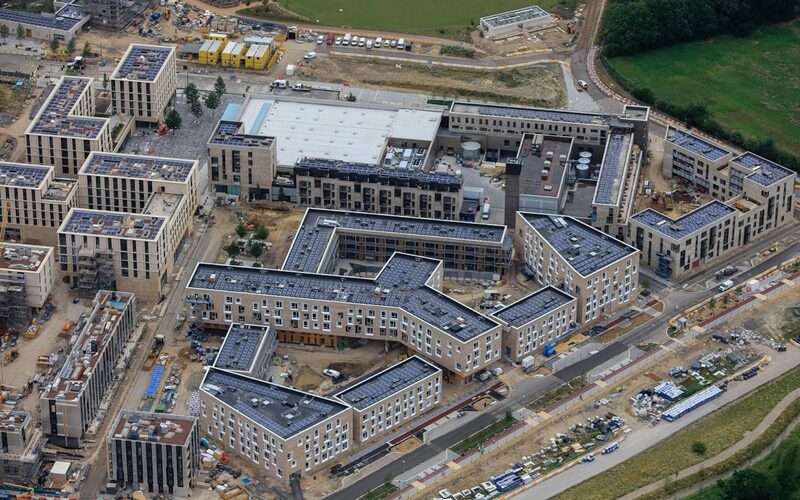 The Eddington development in Cambridge has seen significant amounts of rooftop solar deployed on new housing units despite the Zero Carbon Policy homes scrapping. Image: G&H Sustainability. Former chancellor George Osborne’s decision to scrap the Zero Carbon homes policy is costing occupants of new-build homes more than £200 per year, essentially three times the targeted savings from Ofgem’s price cap. New analysis from the Energy and Climate Intelligence Unit has found that the policy move, one of the newly-elected Conservative government’s first in the spring of 2015, has cost owners of new-build homes £120 million in additional costs to date. And that figure is set to rise to more than £2 billion by 2020 as further newly-built homes are occupied. ECIU analysis has found that each new build home that’s occupied today will cost an extra £208 – 233 to heat, effectively three-times the average £76-per-year saving from the government-backed, Ofgem-enforced price cap. The Zero Carbon Homes policy was due to come into effect in 2016, having been first announced in 2006 by then-chancellor Gordon brown. The policy would have ensured that all new houses would have had to generate as much energy on-site as they consume, dramatically slashing energy bills and delivering vital carbon emissions reductions from the built environment. But the policy was scrapped just months before it was due to come into force, prompting angry responses from opposition parliamentarians and the energy and building sectors alike. Ex-energy secretary Ed Davey, who became a staunch critic of Conservative energy policy having lost his seat at the 2015 election, described the scrapping of the Zero Carbon Homes policy as the “worst thing the Tories have done” in the autumn of 2015, comparing the decision against a packed field of clean energy cuts. In addition, the ECIU points to the fact that carbon emissions from UK homes have in fact risen over the past two years, coinciding with a period of time in which the UK has lacked a comprehensive domestic energy efficiency scheme. Jonathan Marshall, head of analysis at the ECIU, said that successive governments have struggled to devise effective domestic energy efficiency schemes, contrasting with the Zero Carbon Homes policu that “could have made a real difference”. “As well as future-proofing new homes, the policy would have saved families money, reduced Britain’s vulnerability to energy supply shocks, and cut carbon emissions. “Tackling new build homes is one of the easiest ways of improving the UK’s leaky housing stock, and reintroducing this policy could also deliver a boost to firms involved in insulation and low-carbon heating,” Marshall said. His sentiments were echoed by Paula Higgins, chief executive at the Homeowners Alliance, who said that energy bills was one of the most regular concerns raised by consumers.